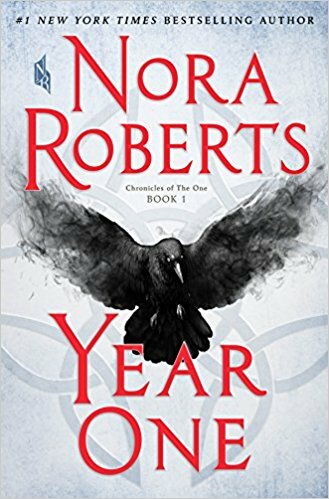 The first book in a post apocalyptic fiction trilogy from bestselling romance author Nora Roberts. When the world as they know it ends, the survivors of a mysterious plague are faced with a new world in which both dark and light magic are rising. Roberts is at the top of her suspense game in the opening chapters of the novel, which are eerily prescient and hopefully not portentous ... That’s one of the unique things about this powerful, engaging novel: there is no 'big bad' as there often is in other Nora Roberts classics: no ex-lover from the past coming back for revenge, no crooked businessman trying to put a family’s legacy into the ground…there is evil and darkness for sure, in the forms of the prejudiced, and of the power-hungry…and of course, of The Doom itself. But the evil our heroes and heroines must combat is the evil we see every day when we look into the mirror. When we let down our fellow humans by being selfish, or afraid: It’s us. After publishing more than 200 novels, Roberts knows exactly how to spellbind an audience. And Year One barrels along for a couple hundred pages with heartbreaking losses, hair-raising escapes and gruesome attacks ... Once the cast of likable human and Uncanny survivors starts rebuilding society, the plot shifts down from the thrill of apocalyptic disaster to the tedium of inventory control ... Unfortunately, having concocted a worldwide calamity, Roberts seems unwilling to imagine just how radically civilization would react to such historic decimation — and the arrival of magical creatures. For roughly the first quarter of Nora Roberts’s postapocalyptic saga Year One, all the formulas for a good thriller are deployed to magnificent effect ... The epidemic that follows, eventually wiping out billions, is described with relentless brutality as governments collapse and things fall apart. In power and poignancy, this segment of Year One is a match for end-of-the-world classics like Stephen King’s The Stand, Nevil Shute’s On the Beach and the better zombie apocalypses. And then the tension just … stops. Once the bulk of the human race is dead, the pace of events slows drastically ... As a venerated romance writer with hundreds of books under her belt, Roberts could have brought an exciting perspective to the postapocalyptic subgenre. Romance novels tend to center character and emotion in a way most science fiction and fantasy novels can’t or won’t — but for some reason Roberts chooses not to do so in Year One. This results in a story of shallow people, striving for not all that much, in an implausible world. A frustrating disappointment. What did you think of Year One?